Sophomore guard, Mireille Minassian hit the go ahead point at the free throw line with five seconds on the clock to seal the victory for the Lady Minutemen. After three tough defeats without their only senior co-captain Cherise Masuda, the point guard rejoined the team Friday night still feeling weak from her bout with the flu. Cherise was not only an inspirational leader but she was the leader in scoring with 15 points, three steals and added seven rebounds. Freshman center, Mikayla Murphy had a career high 14 rebounds to go along with six points. The leading scorer in the San Gabriel Valley, Patil Yaacoubian who averages 24 points per game was held in check with on five points but stated in a jubilant locker room, “I don’t mind being the decoy as long as we get the win.” Earlier in the day Patil saw Cherise at school for the first time in over a week and almost tackled her with joy, causing Coach Smalley to panic. 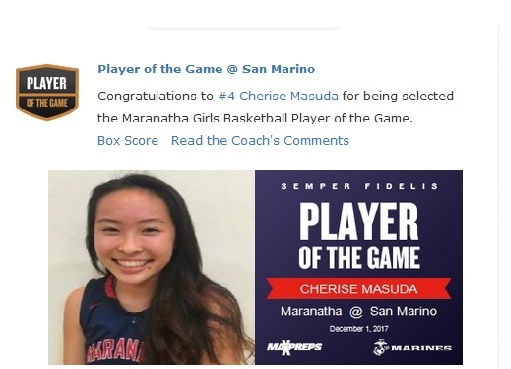 “My goal was to only play Cherise for a short while if she survived Patil’s bear hug at school, however Cherise wanted to be on the floor and we were so fortunate to have her back.” After the thriller all of the parents and Maranatha fans joined the team in the locker room for what Coach Smalley said felt like Thanksgiving. The Lady Minutemen will next be in action on Monday at the Burroughs High tournament verses Burroughs@ 8:00 PM. Let’s go ladies great job!